And Saul spoke to Jonathan his son, and to all his servants, that they should kill David. But Jonathan Saul’s son delighted much in David: and Jonathan told David, saying, Saul my father seeks to kill you: now therefore, I pray you, take heed to yourself until the morning, and abide in a secret place, and hide yourself: And I will go out and stand beside my father in the field where you are, and I will commune with my father of you; and what I see, that I will tell you. And Jonathan spoke good of David to Saul his father, and said to him, Let not the king sin against his servant, against David; because he has not sinned against you, and because his works have been to you-ward very good: For he did put his life in his hand, and slew the Philistine, and the LORD worked a great salvation for all Israel: you saw it, and did rejoice: why then will you sin against innocent blood, to slay David without a cause? And Saul listened to the voice of Jonathan: and Saul swore, As the LORD lives, he shall not be slain. And Jonathan called David, and Jonathan showed him all those things. 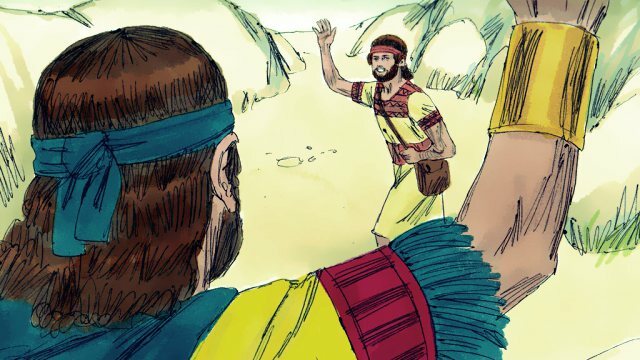 And Jonathan brought David to Saul, and he was in his presence, as in times past. And there was war again: and David went out, and fought with the Philistines, and slew them with a great slaughter; and they fled from him. And the evil spirit from the LORD was on Saul, as he sat in his house with his javelin in his hand: and David played with his hand. 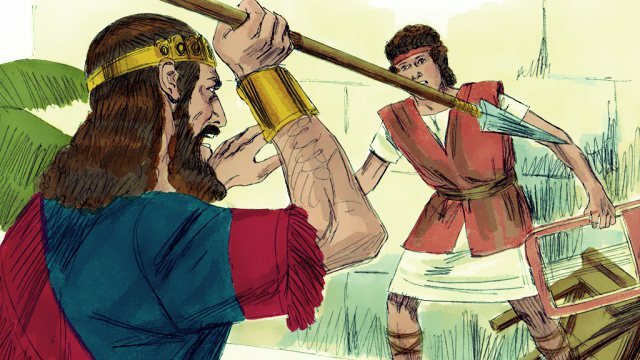 And Saul sought to smite David even to the wall with the javelin: but he slipped away out of Saul’s presence, and he smote the javelin into the wall: and David fled, and escaped that night. Saul also sent messengers to David’s house, to watch him, and to slay him in the morning: and Michal David’s wife told him, saying, If you save not your life to night, to morrow you shall be slain. So Michal let David down through a window: and he went, and fled, and escaped. And Michal took an image, and laid it in the bed, and put a pillow of goats’ hair for his bolster, and covered it with a cloth. And when Saul sent messengers to take David, she said, He is sick. And Saul sent the messengers again to see David, saying, Bring him up to me in the bed, that I may slay him. And when the messengers were come in, behold, there was an image in the bed, with a pillow of goats’ hair for his bolster. And Saul said to Michal, Why have you deceived me so, and sent away my enemy, that he is escaped? And Michal answered Saul, He said to me, Let me go; why should I kill you? So David fled, and escaped, and came to Samuel to Ramah, and told him all that Saul had done to him. And he and Samuel went and dwelled in Naioth. And it was told Saul, saying, Behold, David is at Naioth in Ramah. And Saul sent messengers to take David: and when they saw the company of the prophets prophesying, and Samuel standing as appointed over them, the Spirit of God was on the messengers of Saul, and they also prophesied. And when it was told Saul, he sent other messengers, and they prophesied likewise. And Saul sent messengers again the third time, and they prophesied also. Then went he also to Ramah, and came to a great well that is in Sechu: and he asked and said, Where are Samuel and David? And one said, Behold, they be at Naioth in Ramah. And he went thither to Naioth in Ramah: and the Spirit of God was on him also, and he went on, and prophesied, until he came to Naioth in Ramah. And he stripped off his clothes also, and prophesied before Samuel in like manner, and lay down naked all that day and all that night. Why they say, Is Saul also among the prophets? And David fled from Naioth in Ramah, and came and said before Jonathan, What have I done? what is my iniquity? and what is my sin before your father, that he seeks my life? And he said to him, God forbid; you shall not die: behold, my father will do nothing either great or small, but that he will show it me: and why should my father hide this thing from me? it is not so. And David swore moreover, and said, Your father certainly knows that I have found grace in your eyes; and he said, Let not Jonathan know this, lest he be grieved: but truly as the LORD lives, and as your soul lives, there is but a step between me and death. Then said Jonathan to David, Whatever your soul desires, I will even do it for you. And David said to Jonathan, Behold, to morrow is the new moon, and I should not fail to sit with the king at meat: but let me go, that I may hide myself in the field to the third day at even. If your father at all miss me, then say, David earnestly asked leave of me that he might run to Bethlehem his city: for there is a yearly sacrifice there for all the family. If he say thus, It is well; your servant shall have peace: but if he be very wroth, then be sure that evil is determined by him. Therefore you shall deal kindly with your servant; for you have brought your servant into a covenant of the LORD with you: notwithstanding, if there be in me iniquity, slay me yourself; for why should you bring me to your father? And Jonathan said, Far be it from you: for if I knew certainly that evil were determined by my father to come on you, then would not I tell it you? Then said David to Jonathan, Who shall tell me? or what if your father answer you roughly? And Jonathan said to David, Come, and let us go out into the field. And they went out both of them into the field. And Jonathan said to David, O LORD God of Israel, when I have sounded my father about to morrow any time, or the third day, and, behold, if there be good toward David, and I then send not to you, and show it you; The LORD do so and much more to Jonathan: but if it please my father to do you evil, then I will show it you, and send you away, that you may go in peace: and the LORD be with you, as he has been with my father. And you shall not only while yet I live show me the kindness of the LORD, that I die not: But also you shall not cut off your kindness from my house for ever: no, not when the LORD has cut off the enemies of David every one from the face of the earth. So Jonathan made a covenant with the house of David, saying, Let the LORD even require it at the hand of David’s enemies. And Jonathan caused David to swear again, because he loved him: for he loved him as he loved his own soul. Then Jonathan said to David, To morrow is the new moon: and you shall be missed, because your seat will be empty. And when you have stayed three days, then you shall go down quickly, and come to the place where you did hide yourself when the business was in hand, and shall remain by the stone Ezel. And I will shoot three arrows on the side thereof, as though I shot at a mark. And, behold, I will send a lad, saying, Go, find out the arrows. If I expressly say to the lad, Behold, the arrows are on this side of you, take them; then come you: for there is peace to you, and no hurt; as the LORD lives. But if I say thus to the young man, Behold, the arrows are beyond you; go your way: for the LORD has sent you away. And as touching the matter which you and I have spoken of, behold, the LORD be between you and me for ever. So David hid himself in the field: and when the new moon was come, the king sat him down to eat meat. And the king sat on his seat, as at other times, even on a seat by the wall: and Jonathan arose, and Abner sat by Saul’s side, and David’s place was empty. Nevertheless Saul spoke not any thing that day: for he thought, Something has befallen him, he is not clean; surely he is not clean. And it came to pass on the morrow, which was the second day of the month, that David’s place was empty: and Saul said to Jonathan his son, Why comes not the son of Jesse to meat, neither yesterday, nor to day? And Jonathan answered Saul, David earnestly asked leave of me to go to Bethlehem: And he said, Let me go, I pray you; for our family has a sacrifice in the city; and my brother, he has commanded me to be there: and now, if I have found favor in your eyes, let me get away, I pray you, and see my brothers. Therefore he comes not to the king’s table. Then Saul’s anger was kindled against Jonathan, and he said to him, You son of the perverse rebellious woman, do not I know that you have chosen the son of Jesse to your own confusion, and to the confusion of your mother’s nakedness? For as long as the son of Jesse lives on the ground, you shall not be established, nor your kingdom. Why now send and fetch him to me, for he shall surely die. And Jonathan answered Saul his father, and said to him, Why shall he be slain? what has he done? And Saul cast a javelin at him to smite him: whereby Jonathan knew that it was determined of his father to slay David. So Jonathan arose from the table in fierce anger, and did eat no meat the second day of the month: for he was grieved for David, because his father had done him shame. And it came to pass in the morning, that Jonathan went out into the field at the time appointed with David, and a little lad with him. And he said to his lad, Run, find out now the arrows which I shoot. And as the lad ran, he shot an arrow beyond him. And when the lad was come to the place of the arrow which Jonathan had shot, Jonathan cried after the lad, and said, Is not the arrow beyond you? And Jonathan cried after the lad, Make speed, haste, stay not. And Jonathan’s lad gathered up the arrows, and came to his master. But the lad knew not any thing: only Jonathan and David knew the matter. And Jonathan gave his artillery to his lad, and said to him, Go, carry them to the city. And as soon as the lad was gone, David arose out of a place toward the south, and fell on his face to the ground, and bowed himself three times: and they kissed one another, and wept one with another, until David exceeded. And Jonathan said to David, Go in peace, for as much as we have sworn both of us in the name of the LORD, saying, The LORD be between me and you, and between my seed and your seed for ever. And he arose and departed: and Jonathan went into the city. David and Bathsheba (2 Samuel 11:1-13) And it came to pass, after the year was expired, at the time when kings go forth to battle, that David sent Joab, and his servants with him, and all Israel; and they destroyed the children of Ammon, and besieged Rabbah. But David tarried.. The Ark Brought to Jerusalem (2 Samuel 6:12-15) And it was told king David, saying, The LORD has blessed the house of Obededom, and all that pertains to him, because of the ark of God. So David went and brought up the ark of God from the house of Obededom..
Solomon Judges Wisely (1 Kings 3:16-28) Then came there two women, that were harlots, to the king, and stood before him. And the one woman said, O my lord, I and this woman dwell in one house; and I was delivered of a child with her in the house. And..